Next to the Point Reyes visitor center are stables, a weather station, a picnic area, a large parking area and several footpaths; most used is the Bear Valley Trail that runs up one valley, over a ridge then down a second valley, reaching the coast at Arch Rock after 4.4 miles. Another quite popular destination near the visitor center is the summit of 1,407 foot Mount Wittenberg. But the vast majority of visitors prefer to drive to the beaches rather than walk, and for that there are four main roads. 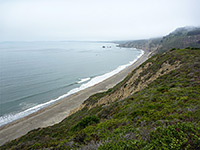 The shortest route to the ocean (7.5 miles) is Limantour Road, starting 1.5 miles north of the visitor center turn off, along Bear Valley Road. This winds over the hills, through a few 10 mph bends and steep sections before leveling out and ending at a parking area next to the beach, which at this point is wide and sandy. 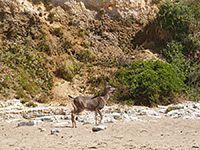 Like most beaches along this part of the California coast, strong currents and big surf usually make the sea to rough for swimming, so the preferred activities are sunbathing, picnicking, bird-watching or just walking about. To the northwest, Limantour Beach continues a long way, forming a narrow promontory between the ocean and a large inland lagoon. 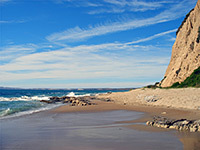 In the other direction, the beach also remains mostly sandy and is soon flanked by vertical sandstone cliffs that rise up and become around 200 feet high. 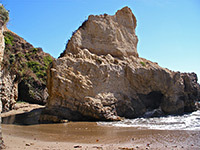 The rocks extend into the water in some places, forming terraces, arches, mini islands and other photogenic features; one good location is Sculptured Beach, 2 miles from the carpark and also reachable by a 6 mile trail from Bear Valley. 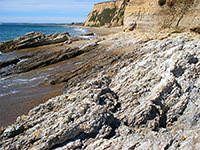 This is perhaps the most scenic section of the whole coast, although the shore is similar for about 10 more miles southwards, to the far end of the Point Reyes peninsula at Bolinas Bay. 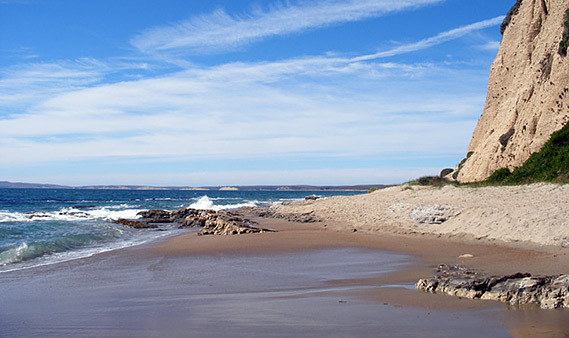 All the beaches are clean and litter-free, the sands covered in places only by mussel shells and patches of seaweed. The Coast Trail follows much of this part of the shoreline, often right at the edge of the cliffs though occasionally veering inland to avoid several deep, bushy ravines. Walking along the beach is possible only in sections, as the protruding rocks sometimes extend quite far out to sea creating an impassable obstacle. The main road in Point Reyes is Sir Francis Drake Highway, commemorating the English mariner who visited the peninsula in 1579, stopping for a while to repair his ship in an sheltered lagoon now known as Drakes Estero. The road follows the west side of Tomales Bay, passing several small villages and private enclaves within the federal land, then turns west, across wooded Inverness Ridge and down into flatter, unforested terrain near the ocean, much of which is used as grazing for working horse ranches. Side roads branch off to Point Reyes Hill (one of the highest summits on the peninsula, at 1,336 feet), to three trailheads and to several beaches, before ending right at the far end of the land at Point Reyes Lighthouse, built in 1870 at the edge of the rugged cliffs quite high above the water. This saw continuous service for over 100 years, before being retired in 1975, replaced by an automated system. The rocks below the lighthouse are home to a noisy population of sea lions, and the overlook - officially the windiest location on the whole Pacific coast - is also one of the best places in the park to watch migrating grey whales, who pass by between January and April. Nearby Chimney Rock is guarded by more dramatic cliffs, provides the best overall views of the south side of the peninsula, and is home to a particularly varied selection of wildflowers. 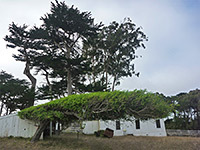 The main facilities along Sir Francis Drake Highway are on the sheltered east side of the coast at Drakes Beach, which has a second visitor center (Kenneth Patrick) and a cafe. 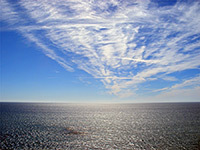 The third route (Pierce Point Road) branches off the highway near the highpoint of Inverness Ridge and leads to several less-visited sites in the north section of the national seashore. It first reaches the western section of Tomales Bay State Park, which has a pine forest, meadows, areas of marshland, small coves and four sandy beaches. The road bends west towards the Pacific coast and passes two short trails, one to Abbots Lagoon (1.4 miles - a good place for bird-watching) and the other to Kehoe Beach (0.6 miles), then ends soon after at the historic Pierce Point Ranch from where a short path leads to another secluded beach (McClures) and a longer, 4.7 mile trail continues right to the far north end of the peninsula at Tomales Point. This remote area is home to a protected group of about 400 tule elk, a colony re-established in the 1960s, long after the original native herd that used to roam here was driven away by early settlers. The narrow southern section of the peninsula can be explored starting from three trailheads along Hwy 1, the main one being Five Brooks, but the most popular access point is the Palomarin Trailhead at the end of Mesa Road, a short route heading northwest from the small town of Bolinas. The road passes one of two US Coast Guard properties within the national seashore, becomes unpaved for a short distance and ends at a large parking area. 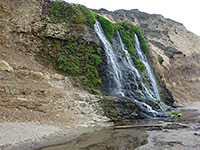 A short trail descends to adjacent Palomarin Beach while the main path - the Coast Trail - leads northwards to many destinations including Alamere Falls, Wildcat Beach, Arch Rock and five woodland lakes.